It has been brought to my attention that this link was not working properly. I have reuploaded the Add-On for you guys. Here is the PTU Kit at my shop and below it is the Free Add-On. And here is the ReUploaded Add-On !!! Enjoy! This is a beautiful kit. Thank you so much for sharing the QPs. I am usually low on time to scrap, but your QPs give me the same nice feeling of having a page of my sweet kids done without having to spend all of the time doing it! Thanks again! Thank you so much for this very pretty kit. Your creations are beautiful and I want to thank you so much for your generosity in sharing them. Thank you! I especially love the papers! 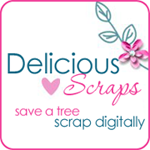 I'm new to blogging and just started my own Digital Scrapbooking blog, Snack Scraps. Check it out and let me know what you think! Feedback is much appreciated!